Just in the nick of time I have managed to get the video for week 16 of Mandala Madness to you on time. This week we are starting the final stage of our journey together, the end is in sight now. Just a few more steps…. Our final encore for our mandala begins with the sun slowly setting on the horizon. This week we are making a series of half-suns at the outer edge of the mandala. Next week we will decorate the suns a bit more and then we will complete the last edges in week 18. A not of warning, the suns are not all identical and they are not spaced equally from each other, so keep paying attention to the pattern. All videos for Mandala Madness are available through my YouTube channel and on my blog grouped on this dedicated video page. In the video for week 16 I show you how to work the stitches for this week. 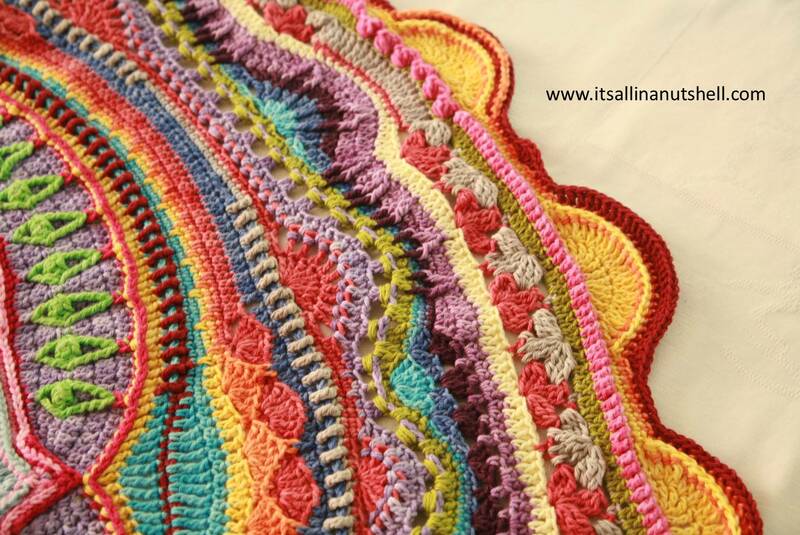 I use two Scheepjes yarns for my mandala; Scheepjes Sunkissed and Scheepjes Cotton 8 with a 3mm (D-3) hook. There are yarn packs available for this CAL in Scheepjes Color Crafter, Scheepjes Stone Washed XL and Scheepjes Merino Soft, available from Deramores and Wool Warehouse. Here a list of the colors I used for week 15. I am currently working on the video for week 17 and there are a lot of details for next week. Not difficult, just time consuming. Hence I can’t guarantee that it will be ready next week. I will do my best, promise. Oh oh oh! It is turning out so fantastic!